In the early 1950’s and 1960’s, information technology was a little known phrase that was used by those who works in the places like hospitals and banks to describe the process they used to store the information. The paradigm to shift the paperless workplaces and computing the information technology has come to a household phrase. Information technology define an industry that uses the networking, software programming, computers and other processes and equipment to process, retrieve, store, protect and transmit the information (Thomsett, 1980). 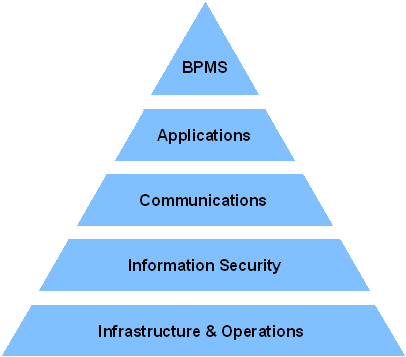 Business process management system (John, 1982). Workers should not try to sell the new services or applications to their boss if the servers are shut down every week, the network of data is not able to support all the needs of business or the wait hours of end users and the days to solve their incidents of information technology (Baker, 1988). After the infrastructure is extended and if it is working smoothly, then the business require its difficult information to be protected. If the procedures of information technology or the Information Security cannot provide the required level of security to manage the information electronically, they should be sure that the confidence in their IS is lost and the other alternatives is found. In today’s business the response time of people’s server of the internet or the easiness to contact with their technical support, can make the customers to love their products. This layer not only covers the front end of customer but also the back office of their systems and the way they open to their providers through the use of standard protocols to exchange the data. If people can get their forecast of demand automatically back in their own system there is a restructure of solid network of partners for the business who are rising to work in their company (Davidson, 1998). A lot of enterprise is performing well for the previous layers, without a named CIO. The skills of the information distributed through the department are possible to survive, with the help of some external consultancy. The risk is to develop a cluster of information, with the difficulties to get an integrated system. The way an enterprise manages the level of IS reveals company’s culture. An individual‘s behavior is led to store the information without any difficulties to share it. On the other side, esteem and consideration for the rest of the company, is reflect more and more integrated IS where the information is available in an easy way to those who require it (Adams, 1982). Integration means that the job depends on the information that others have to provide to the system. A lot of integrated implementation of IS like Enterprise Resources Planning fail at this point as the inter-dependency of different departments from each other is not reviewed and explained clearly. People should be sure that all the users of the integrated system know their maxim. They explain about not sharing the information is a lack of respect of others and sometimes it is a criminal act (Martin, 1982). Installing the rules of business in the existing integrated systems such as Enterprise Resource Planning, Customer Relationship Management (Paul, 1990). Puts a front end layer for the user on the top of the existing systems. To perform this integration is the Business Process Management Suite. Business Process Management is the point where the management of information technology transcends the nature of technology and meets the needs of business and Psychology of the organization (Quentin, 2000). James P, FUNDAMENTALS OF PROJECT MANAGEMENT, 1997. Lewis P, A Guide to the Project Management Body of Knowledge, 2000. John R, Roles and Responsibilities of the Project Manager, 1982. Baker S, the Complete Idiot’s Guide to Project Management, 1998. Davidson J, Managing Projects in Organizations: How to Make the Best Use of Time, Techniques, and People, 1987. Martin D, Negotiating and Contracting for Project Management, 1982. Richard S, Construction Project Management, John Wiley & Son, 2000. Mary F, Real-World Project Management: New Approaches for Adapting to Change and Uncertainty, 1997. Quentin W, Earned Value Project Management, 2000. IT consumerization- Bring your own device Information technology (IT) consumerization, also known as “ bring your own device” phenomenon has been explored by Gartner (2012). Since the past few years, there has been a substantial change in IT which will possibly continue for the predictable future.